I had so many ideas, but finally settled on taking inspiration from my sketchbook, the one I almost completed after a weekend workshop with Laura Kemshall. The focus of my work was taken from a still life, which included bottles, fruit, flowers and jugs. The Mateus wine bottle shape has always been a favourite of mine and after getting that shape right, the rest just fell into place. 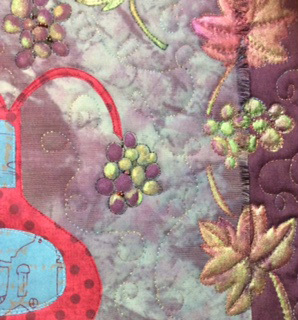 Bonded appliqué shapes, hand drawn leaves and fruit with fabric paints to strengthen the colours and portray the lusciousness of the grapes and vine leaves. Loose, casual style machine quilting in variegated metallic thread. 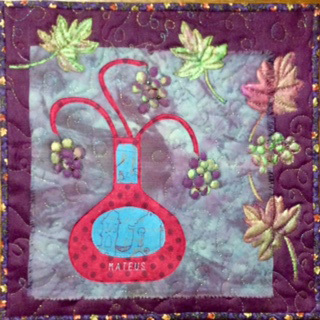 You really had the right background “wine”colors for this piece. The rich colored leaves indeed strengthen the background colors. Good wine colors! I like the grapes and leaves.